HDTV Supplys WolfPack™ Modular 18x28 HDMI Matrix Switcher with Video Wall Processor is an integrated HDMI video and HDMI audio modular HDMI matrix routers. The chassis back plane allows various technologies to be converted and switched eliminating external converters and it allows any input to be routed to any output, or the same input to be routed to all outputs, or any combination with multiple technologies. 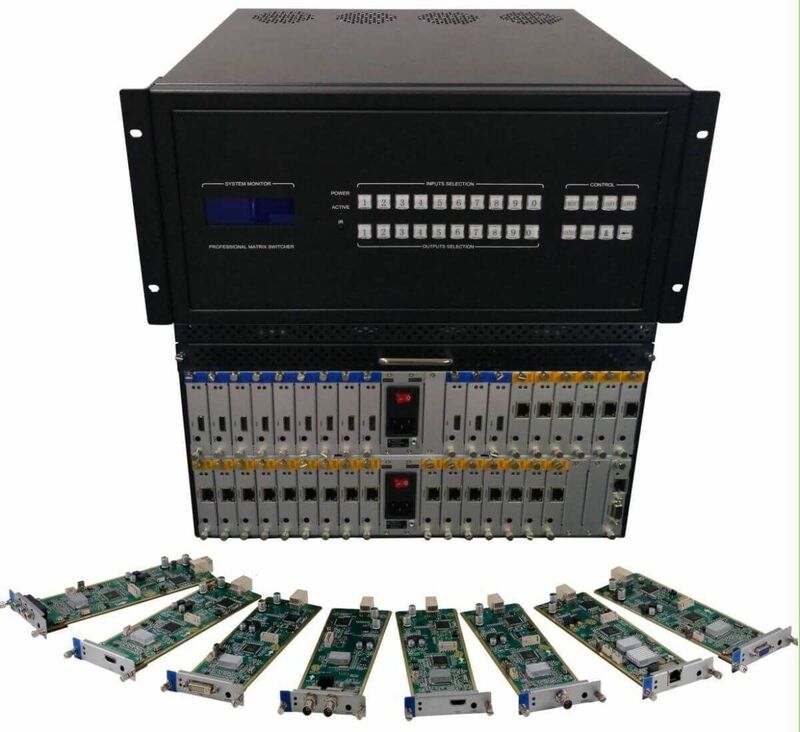 The core of the 18x28 HDMI Matrix Switcher with Video Wall Processor consist of a 36x36 Modular Matrix chassis and its highly configurable backplane that supports up to 36 input cards and up to 36 output cards. It is also 1080p 4:4:4 compliant. 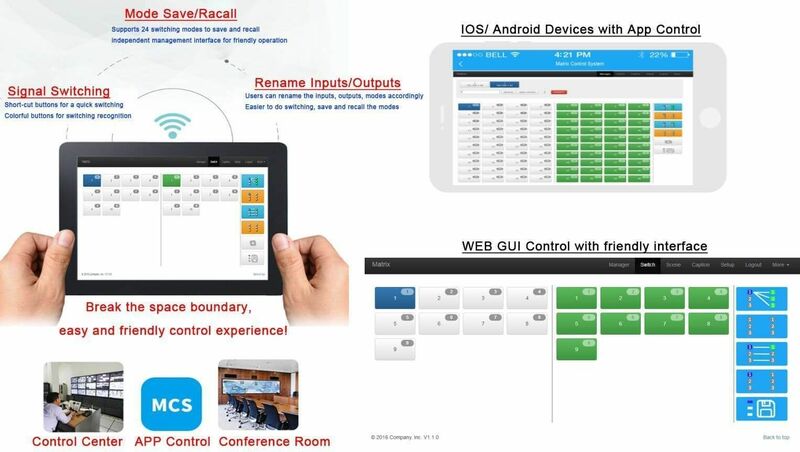 You can control the switch via its IOS or Android app, 2-button fast switch from the front buttons, a WEB GUI control or the RS-232 serial port. The matrix does not have IR nor a remote control but can be controlled with its iOS and Android App as well as above. 100ms Seamless HDMI Switching: This WolfPack™ Seamless 18x28 HDMI Matrix Switcher delivers 100ms instantaneous video switching with full 1080p/60 video at each port. This high-performance engine processes HDMI signals by executing EDID hops and HDCP handshakes simultaneously at both the source input, the display outputs and scales the inputs for the best output resolution. It sets the output clock timing and uses a frame buffer to retain the input signal information for the fastest output. The WolfPack Seamless 18x28 HDMI Matrix Switcher allows switching between inputs with a clean video cut and frame-to-frame switching with no glitches. The WolfPacks Modular HDMI Matrix Switcher advanced processor allows it to process live signals simultaneously which means it can seamlessly and instantly switch (~100ms or 0.1 second) between HDMI inputs and outputs. Most non-seamless HDMI matrix switchers require a delay of several seconds before they can switch between devices but with this WolfPack family that wait time is completely eliminated. The WolfPack 18x28 HDMI Matrix Switcher with Video Wall Processor manages many type of HDMI signals. These Modular HDMI Matrix Routers support long haul transmission, maintains power reliability in the event of failure and offer the best flexible solutions for an AV system deployment. Our Modular HDMI Matrix Routers also can support high-resolution HDMI sources routed to HDMI displays, monitors, projectors, or audio receivers, etc. The EDID can be selected between seven different modes or copied from the attached displays. The heart of the 18x28 HDMI Matrix Switcher with Video Wall Processor are the WolfPack chassis backplane which allows customization of the configuration for input and output cards to match every need of the system and application. The matrix support hot-plugs and you can change the cards while the equipment are still working. Why not buy this 18x28 HDMI Matrix Switcher with Video Wall Processor today?